I have been meaning to share a little bit of feedback on CrossFit Memorial and this morning I finally had the time to do it. I truly believe that this gym is amazing (life changing) and felt that I should let you know why. As you may remember me telling you, I was introduced to CF two years ago and started my training at another CrossFit. I went to the On Ramp with a friend and when I quickly realized that she no longer wanted to go, I decided to give it a whirl on my own. The gym was VERY intimidating. There were few women that attended and the ones that did were experienced in CF, competed regularly and all had 6 pack abs. They didn’t even own bands at that gym…so if you couldn’t do a pull-up, you better learn fast. I attended classes 3-4 times a week and really liked how challenging the WOD's were. I often went to open gym on the weekends to get more instruction of lifts but rarely got the help that I needed. The instructors often seemed to be distracted and were focused on lifting “heavy”. My husband made me a mini gym in my garage to work on pull-ups, kettle bell swings etc. I was very determined! Though after 6-8 months, I realized I really didn’t have many friends there. Folks were not very friendly and I always had to make the effort to chat/meet someone. The instructors were all friendly, however, after 2 years of classes, I knew that I was not where I wanted to be physically. My last month at that CrossFit I was the only girl in the 5:30pm class – I was ready for a new location. After only a week at CF Memorial, I was blown away. I had already collected two phone numbers from other girls and didn’t meet anyone who wasn’t smiling and welcoming. Every single instructor came up and introduced themselves and noticed that I was new. Whether I went to morning classes or evening, I received great feedback on form and the correct way to do a movement. This came from all coaches. I have only been at this gym since May and have improved drastically on all of the lifts. I still have a long ways to go…but I feel encouraged here. It is very empowering. I have some mental fears regarding my knees and lifting weight overhead (I had a major knee surgery in college) and find myself slowly working through that safely. I am very proud of what I have accomplished here in a short time and owe that to the amazing coaching and encouraging members. 1. I feel you do a great job with the warmups at this gym. You spend ample time warming up for the WODs, more than any other gym I have been to (about 4 gyms). 2. I love that Saturdays are mostly partner WODs. It’s a great way to meet new people and interact with folks that go to different classes. 3. Amanda/Will/Ralph – I don’t have enough nice things to say about them. All so encouraging, positive and take coaching very seriously. They all push me in class but are approachable if I need extra help/advice. I really feel that Amanda is a star coach. She really has a way with people and makes class “fun” with her witty remarks. They have all worked with me individually on movements during/before/after class. Ralph has helped me extensively on my squat form, which continues to improve with time. 4. Manny introduced himself to me randomly while I was working on my butterfly pull-ups and stopped what he was doing to work with me. I got a few the other days thanks to his advice! 5. Alex is fantastic at instruction and really “breaks down” the lifts which makes it easy to understand. 6. Vanessa is always smiling and makes it a point to say hi. 7. The gym is clean and orderly. 8. I wish you offered a 5:30pm class on Friday’s but other than that, you offer a great schedule. Last but not least, you are truly a remarkable coach! This is definitely what you are meant to do, I felt it was important to tell you my thoughts since you are an owner of CF Memorial. I look forward to many more WODs! It was 2014 when I signed up for CrossFit- a workout regime I had previously been skeptical about but knew was better than the one I was previously doing: nothing. I've always played sports and been active, but since high school athletics, I had not established a set workout routine- all I knew is that I never wanted to run a timed mile again. My weight has always been a constant thought, but so have cold beverages and Mexican food...hence my freshman 15#, relationship weight, and slowing metabolism blues. It wasn't until I saw a photo of myself at just the right (wrong) angle that I thought "I'm way too young to be this out of shape and unhappy with my body". A few days later, on January 10, 2014, I emailed about the free Saturday class at CrossFit Memorial. A few classes (and ice packs) later, I sat down and seriously evaluated my lifestyle at that moment vs. the ideal vision I'd come up with and set feasible stepping stone goals. I've always enjoyed eating healthy, but knew I had to be serious about it if I wanted to see results. I started Whole30, worked out 3x a week, and logged my progress as to keep myself on the right track. I quickly learned that the skepticism I once had for CrossFit was unwarranted. I found a class in which I fit in, felt comfortable around, and that held me responsible for showing up. I still say "I'm not a CrossFitter, I just CrossFit" because I don't do competitions or wear Rogue t-shirts, but I do advocate giving CrossFit a try to anybody that wants to start working out. CrossFit works for me because it doesn't get monotonous, the friendly environment is fun, and the coaches are truly helpful. I love that it's a "class" vs. an open gym because I don't know the best movements to get my desired results, nor do I have the will power to keep pushing myself. After eating clean (80% of the time, let's be honest) and sticking with CrossFit 3x a week, I've gone down 3 pant sizes, lost 60#, and in the best shape ever. Even though the "before" pictures still haunt me, it's something I want to share with people who feel unhappy about their body image, who want to get on the right track for being healthier, and/or just need a good workout routine to accommodate their love for cold beverages and Mexican food. It was June of 2014 and I was the heaviest I have ever been, 325 lbs +. For three months I did different exercise plans and workouts with some old routines I used to do when I was in shape to lose 5 whole lbs and to be bored of it all already. I had a colleague that I used to work with that in three months he completely changed his health, body weight and shape, and physical capabilities. I was only 19 but it made such an impact on me when I saw such a difference in such a short amount of time that I never forgot what he had said. He had told me then he went “Paleo” and started doing CrossFit. I had no idea what CrossFit or Paleo was back then and never thought of it twice. Eight years later once I came to the serious decision it was time to make a change in my life and try something new because my old routine wasn’t working for me anymore I remembered those two words, “Paleo” and “CrossFit”. I Googled CrossFit gyms in the area and looked at the schedules to see if I could find a class that worked with my crazy work hours. There were three, but for whatever reason I decided I was going with Crossfit Memorial Houston, and it was the best instinctual decision I have ever made. After getting through the on-ramp class with Christian I was ready to start, at least I thought. It took about a month before I was able to complete my first Metcon under the time cap, and I still have the memory to this day because it was the moment I realized I had found a very special gym. No one really knew me yet, I was just the new fat guy at the 5 am class, and 5 am has some real competitors in it, and there I was just trying to finish my first Metcon. I was of course the last to finish, we had 2 min left and all I had was 20 box jumps left. I felt like I was about to die, I was at the point that I started to doubt I was going to be able to finish, and right when I was ready to give up, Michael Lou, one of the other CrossFitters, came up and asked me how many I had left, and then he preceded to count each one and push me to help me finish the workout. He wasn’t the only one either, after he had started to count and get me going, most of the rest of the gym came over and helped out. That day I knew there was no other gym for me and knew I was in the right place, and that was only the tip of the iceberg. From the owners Vanessa and Tricia and the genuine care that they show each member, to all the amazing coaches that always push you, each have their own special skill set that helps round you out as a complete CrossFitter, Michael Florida’s expert nutritional classes, to the team atmosphere and all the great friends and competition you could ask for. I have been going for 7 months now and have never had a bad workout, bad coaching, or a bad class. In fact I look forward to going every day and learning something new, or getting better at a skill set, or competing against one of my peers. It was the best decision I made when it came to my health. Clean and Jerk: What’s that? 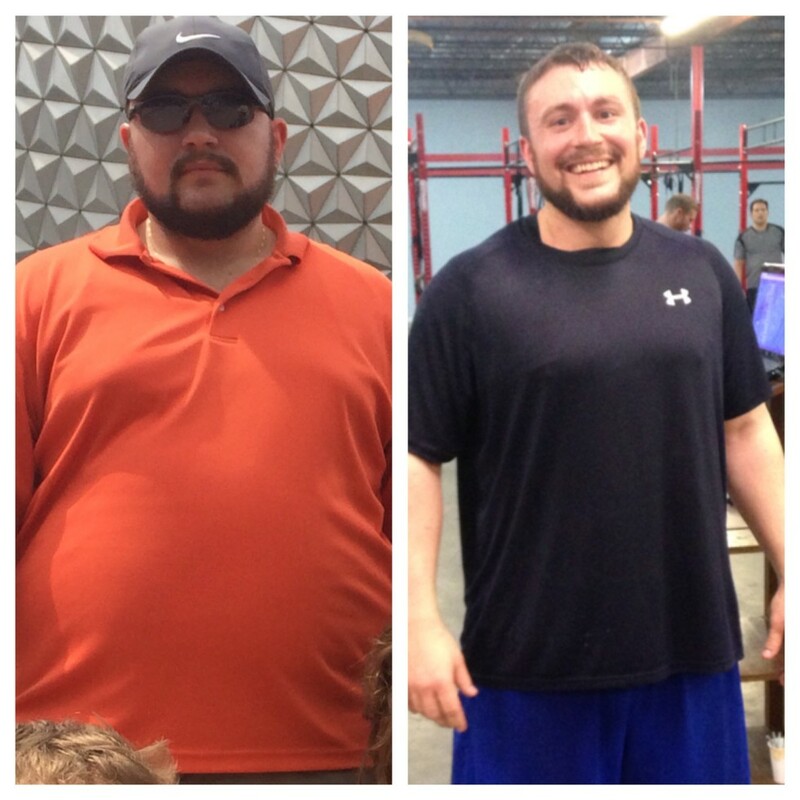 I began at CrossFit Memorial Houston this past February, and it’s been one of the best decisions of my life! Being a former collegiate soccer player and a current competitive runner, I’m familiar with hard work and being fit. But with that said, CrossFit Memorial Houston has taken it to a whole new level for me. I’m now stronger and faster than I used to be, and I’ve never felt better. When I first started CrossFit, I was progressively getting stronger with each WOD and Skill/Lift, but I wasn’t seeing the muscle definition that I desired. I asked my CFMH coaches what were the best diet options to decrease fat and began eating based off of the Paleo diet. After only two weeks of the Paleo Diet, I noticed major results! In my before and after pictures I look like a completely different person! The 1st and 3rd pictures are all while I was doing CrossFit at CrossFit Memorial Houston, but not taking care of myself nutritionally. 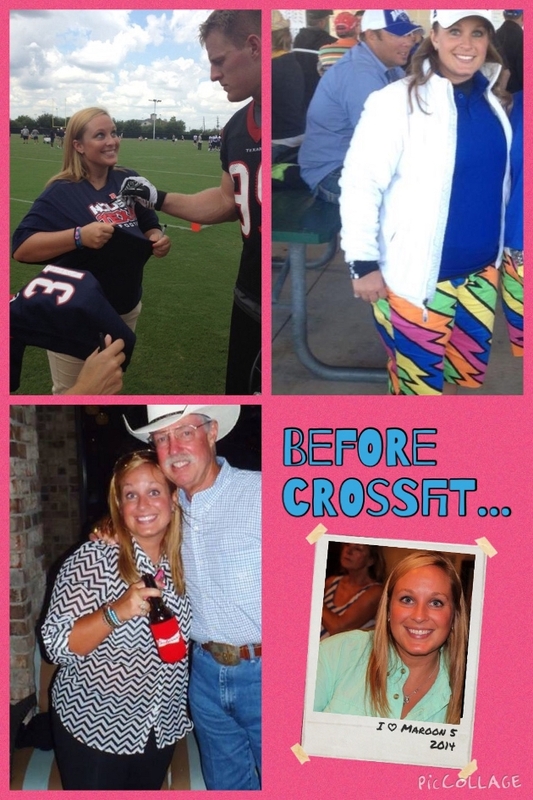 The 2nd and 4th pictures, I’m taking care of myself on the inside and out as suggested by the knowledgeable coaches at CrossFit Memorial Houston. The decrease in fat and increase in muscle tone is so noticeable that I receive compliments most places I go. If you are looking for a healthy way to get in shape and feel better about yourself, I highly recommend CrossFit Memorial Houston. The coaches are extremely helpful, supportive and want nothing but the best for you. They will never allow you to do something incorrectly and put yourself in a situation where you could become injured. They also are wonderful resources on how to make fitness and nutrition work for your specific lifestyle. After a friend encouraged me to do CrossFit I finally worked up the courage to join CrossFit Memorial Houston in September 2013. I was only going to try it for one month but I was hooked after my first couple of classes. I love that every day there is a different workout, its not like going to the gym and using the same 5 machines. After the first couple of weeks I had sore muscles that I didn’t even know I had. Before starting CrossFit I did not consider myself a couch potato but I was average, I ran, went to the gym once in a while and went mountain biking on the weekends but I have to say that after this 7 months in CrossFit this is the best shape I have ever been in, I have lost around 45 lbs and I feel great. I joined CrossFit Memorial Houston in the summer of 2013. Since then I have lost 10 pounds of stubborn body fat, and made huge gains in my strength and endurance. I am faster, stronger and more fit than I have ever been in my life! The box is clean, spacious and well equipped. The coaches at CrossFit Memorial are phenomenal! They go above and beyond to make sure everyone feels welcomed and part of the community. They are exceptional and highly knowledgeable about everything CrossFit related. I trust them to show me the right way to do the movements so that the WOD’s are effective, intense and safe. I am so glad I joined, I wouldn’t go anywhere else. After I got married, my weight had shifted from 180 lbs to 225 lbs in 10 years. I was not doing any workout as often as I should have and was also on the S.A.D. (Standard American Diet) diet. After going to the doctor’s office, I found out my health was basically going downhill. The doctor had to prescribed medication to lower my blood pressure and medication to raise my bad cholesterol (HDL). Then I decided to join a gym and try to do some workouts after work, but for me it was not motivating enough. I was pumped up for a few weeks, but got lazy after doing the same routine over and over again. I started running and biking occasionally, but it was not intense enough and my weight remained the same. I started doing some research and discovered that all the foods I’ve been consuming were junk food. I told myself that I needed to cut out all processed foods and start to eat more natural wholesome foods. This is when I discovered the Paleo lifestyle. I was desperate to try anything at this point to bring my weight down. After 4 months on the Paleo lifestyle change, I lost 25 lbs with minimal workouts. Now that I had lost the weight, I needed something to do to keep me motivated and start toning up. That’s when my friend, Rodney introduced me to CrossFit. After joining CrossFit Memorial Houston for three months, I competed in my first intra-box competition. This is odd because I have never participate nor joined any competition in my life. Then four months later, I ran my first Half Marathon and finished in 2hrs 23min without any formal training for marathons except for CrossFit. Prior to CrossFit, I could never run a mile without having to stop to catch my breath. During the marathon, I ran 11 miles straight without stopping. At age 42, I have developed more strength and energy at CFMH faster than I expected and I am very proud of my achievement in just a few months. I guess, you are never too old to do anything if you set goals and do your best to reach the impossible. CrossFit Memorial Houston, did not just give me the confidence, but also encouraged me to step out of my comfort zone and challenge myself. That’s the only way to ever learn and gain. That’s what made me decide to start joining a few competitions to see where I am and what I need to improve on. I did not feel shameful if I didn’t finish a WOD or a lift, but rather proud because I attempted the WOD and attempted more weight. There are always great people around cheering for me and not laughing at me. My wife and I love CFMH, the people we work out with, and also our coaches. It does not matter which days we workout, there are always cheerful and loving people around at CFMH. We have changed our lifestyle to Paleo for almost two years now and my health has changed tremendously. My allergies are gone and I am no longer taking any medications. I have gone from a size 38 pants to a size 33 throughout the changes. Joining CFMH was our best decision to develop more strength and endurance. At the end you will reward yourself with a new look and more energy to do anything. Remember to eat clean and lift more weights! Thanks to everyone and the coaches at CrossFit Memorial Houston for the great support and the little push. We love ya! I was diagnosed with osteopenia eight years ago. Osteopenia is basically bone mineral density (BMD) which is below normal levels but not low enough to be classified as osteoporosis. Having osteopenia means there is a greater chance of developing osteoporosis, a condition where bones are weak and fractures can occur. My doctor put me on a medication prescribed for osteopenia. After three years, with little improvement, I was taken off the medication and told to walk more. So I started going to the gym, doing free weights and machines. After two months, I hired a personal trainer to encourage and push me, but something was missing. I knew I had to do something that I would enjoy and benefit from. My good friend, Carly, a Crossfit Memorial member, told me I should try Crossfit. The first month I was very sore and questioned whether this was for me at my age. But I continued to come, trying my hardest to get through the workouts. Addiction set in ! The coaches helped modify, when I needed to ,and encouraged me ! Now, two years later, I am here to SHOUT, that my last two bone density tests have shown significant improvement in reversing my bone loss. My doctor asked what had I done differently to accomplish these glowing results. So ladies, just keep moving! Enjoy the variety in your workouts, both physically and mentally.You are contributing to healthy bones and a lifelong commitment to being the BEST you can be at any age! I joined Crossfit Memorial Houston (CFMH) in October of last year in an attempt to lose the last few pounds and inches I gained after having my second daughter almost a year before. I have always enjoyed working out and have completed several marathons, half marathons and triathlons over the last ten years, but I did not think I would ever regain my body shape or endurance level after my two pregnancies. After a few months with CFMH’s boot camp, I joined Crossfit Memorial Houston’s box and took first place in a Nutritional Challenge they hosted this spring! I was amazed at the results of the diet they recommended, as well as by the workouts at the boot camp and the box. Not only have I lost the final few pounds and inches, but I am in the best shape of my life. I feel stronger and overall more tone than I ever have. Vanessa’s dedication to this gym and to ensuring that the members meet their goals is a huge part of my success. I would strongly recommend Crossfit Memorial Houston. So… a year after college, I got into the same old routine of running and doing the same weight lifting routine. Needless to say, this did NOT work wonders for my body. When I found out about CrossFit, I was curious to see what it entailed. I had definitely already tried the kick boxing, body pump, and spin classes, but NONE kept my interest or delivered results. Turns out, Crossfit is an addiction that I keep coming back to week after week! It is never boring–I am consistently surprised by new workouts and challenges! In addition, my body is more toned and tight than what it ever was in college. I recommend CrossFit to anyone that wants to shake up their workout routine, get the best conditioning, and create a lifelong commitment to being healthy and happy! My name is Lori Barr. I am 48 years old and began CrossFit workouts in November 2010. I had been a member of a “big gym” since graduating from college. After completing a half marathon at the end of October 2010 I was looking for something else in my workouts. I decided to give CrossFit a try. 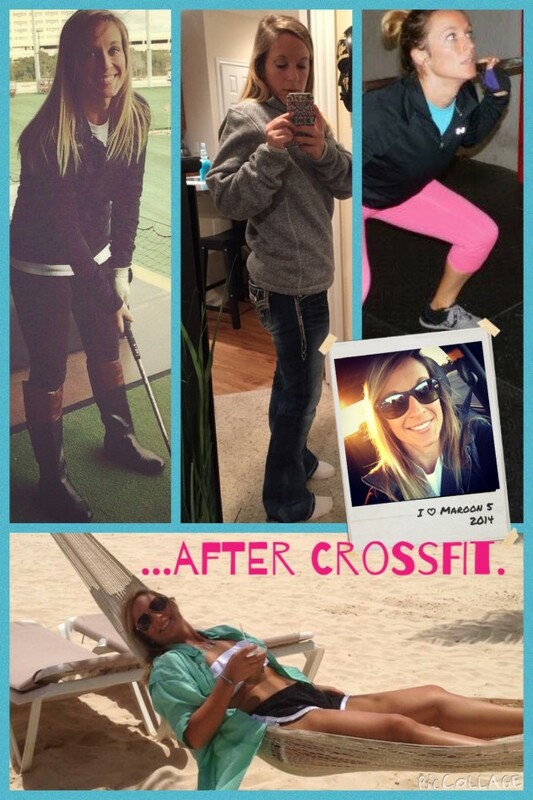 Needless to say – CrossFit has been a blessing in my life. It has pushed me in ways that I had not dreamed and has had me do things that almost seemed impossible, like a “push jerk” or a “Kettlebell swing”. I never even knew what those were! I definitely do now, and I see my strength and skill level grow every time they come up in a workout. I have learned so much about fitness overall through being a part of CrossFit Memorial Houston. The workouts are intense and varied. This has directly carried over to my running. I have seen improvement in my times and overall how I feel! CrossFit is a great total body workout, and if you run you will see great results in your performance times and overall fitness! I just wanted to to let you both know what an impact CFMH has made in my life over the past 6 months. Last February I hit a rough spot – I had very low self esteem, my marriage was struggling, I was 30 years old with two kids and a full time job, and I just felt old (how ridiculous is that?!). I decided things had to change so I started going to the gym 5 days a week – just “working out” on the elliptical and weight machines for an hour. It helped me feel a little better on a day to day basis, but after 5 months of doing it I was bored and had minimal results physically. In June I finally had enough and decided to do two things – I decided I was going to sign up to run the Aramco half marathon in January, and at the urging of a few good friends I decided I was going to try CrossFit. That first week of on-ramp with Christian hooked me…I had never been so tired or sore in my life, and I had never had so much fun working out. It was great to have so much variety in a workout and awesome to actually be able to feel the effects later as I was walking up stairs at work. It was empowering to learn how to do all the Olympic weightlifting movements that a few months ago seem reserved for only the “elite” athletes at the regular gym. It seriously started to change how I thought about and saw myself. So while Crossfit was immediately addicting and transforming – my attempt to start running was not quite as great. Everyone that knows me knows I am not a “runner” – I am not shy about it, I love swimming and cycling, but for my entire life I have HATED running. Even running a mile was an accomplishment. I put off training, and finally the first week of October I decided I either needed to decide I wasn’t going to run, or I needed to start a serious training program. So I downloaded a 16 week training schedule that had cross training built in and went for it. I was great about doing the Cross Training (Cross Fit for me) days. I was not so great about getting all the running days in. The program peaked at a long run of 12 miles and I think the longest I ever ran was 8. Even as I was at the start line last week I was questioning my ability to finish – and I just kept telling myself that if I can do two hours of jump rope clinic or some of the harder CrossFit workouts all I had to do was just be able to run for 2 and half hours and it would be over. Mile 10 I literally found myself just repeating over and over in my head “Just keep moving, just keep moving, one foot in front of the other” – How often have I heard that at CF? Just keep moving! When I finally got to the 1/4 mile marker – all I could think was how it was the same as just one lap around the buildings at CF – just one lap! Obviously I survived, and all week people have been asking me how I trained and how all of the sudden this person who hated running is a “runner”, and honestly my response every time has been “running more didn’t make me a better runner, CrossFit made me a better runner”. I know that you guys didn’t invent CrossFit, but thank you for the type of gym CrossFit Memorial Houston is, thank you for your encouragement and support and always pushing me to go harder and be better. It has literally changed my life and I am so excited to be in such a different place than I was this time last year. I joined Crossfit Memorial Houston last year after many years of going to the ‘big gyms’. I had gained a massive amount of weight due to going through plain routine workouts and eating poorly. My blood pressure skyrocketed and my self-confidence and energy vanished. When I joined CFMH, I was immediately impressed with the atmosphere. The coaches are encouraging, the athletes are competitive and the workouts are challenging which is a reflection of the owner, Vanessa. The box preaches fitness and nutrition equally. I participated in a few of the nutritional challenges and box competition events. I enjoy the friendships that I’ve gained and seeing my fellow athletes accomplishing their goals. I feel like it’s a second family to me. I recommend CFMH to anyone who is looking to get out the boring gym routines, improve their overall health, be competitive and make some friends along the way.